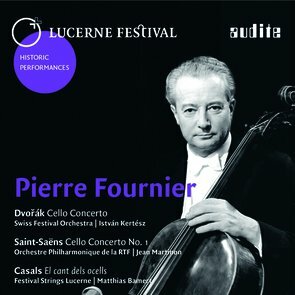 Pierre Fournier was praised as the “aristocrat of the cello.” His soulful, singing tone, simple elegance, and refined sound are very much evident in this live recording from Lucerne, which is being released now for the first time. An especially noteworthy discovery from the archives is Fournier’s encounter with the great Dvorák conductor István Kertész, who was unable to record Dvorák’s Cello Concerto before his premature death. Also included are Saint-Saëns’ First Cello Concerto in A minor (with Jean Martinon leading the Orchestre Philharmonique de la RTF) and the Cant dels ocells by Pablo Casals (with the Festival Strings Lucerne), which up until now was missing from Fournier’s discography. Supplemented with photos from the Festival archive that have never been previously published, the 32-page booklet (in three languages) includes portrayals of all of the artists involved and includes information on the background and context of the performances. LUCERNE FESTIVAL Historic Performances is a series of CDs focused on live recordings of influential Festival artists. The sound from the original tapes is painstakingly restored and supplemented with detailed documentation of the historical and artistic significance of the performances, along with photos and historical materials from the LUCERNE FESTIVAL archive. It’s a history of the Festival in sound.